The prices of main precious metals decreased in Azerbaijan on May 16, according to the data published by the country’s Central Bank. 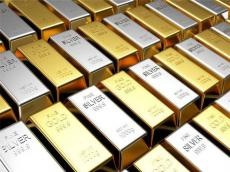 The cost of gold decreased by 28,594 manats to 2200,208 manats per troy ounce in Azerbaijan compared to the price on May 15. The cost of silver decreased by 0.2945 manats to 27.7177 manats per ounce. The cost of platinum decreased by 17.7905 manats to 1529.3285 manats and the cost of palladium decreased by 15.5635 manats to 1672.1115 manats in the country.